In our label stock product range you can mainly find all classic materials like PE and PP, suitable as well for the cosmetic market or food and beverage industry, e.g. with a No-Label-Look, as for the chemical industry and lots of others. This range of products is complemented with PVC– and PO-films and with the new bio-foils (PET). 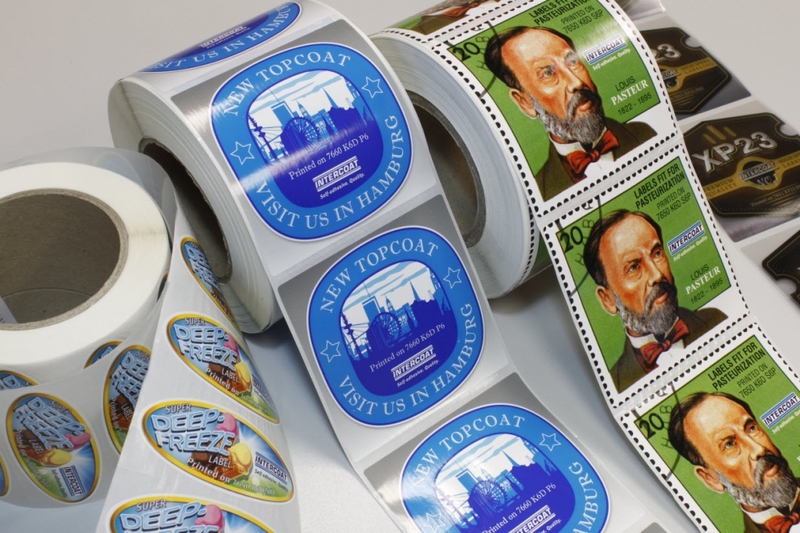 Our unique topcoat has proved itself on the market for many years, no matter which printing technique was chosen. So it comes naturally that we also offer a certified topcoat for your HP Indigo machine. We are able to deliver our top selling products quickly from our stock. Many products are stored for you as half-finished laminates or as ready cut and packed goods for prompt delivery. The top products most favoured by our customers are part of our net program. For these special sorts we keep coated material with defined lengths for you and slice them according to your wishes at short notice. In doing so, we only charge exactly the delivered quantity. If you would like to register for this offer, please send us a short e-mail to login@intercoat.de in order to receive your customer password. You can find our net width range after your individual login here. Whenever it is really urgent, we keep the mostly requested products available, ready cut on full pallets for a prompt delivery. Just follow the link for an overview of the products and available widths. You can find our express range after your individual login here. Various products with different liners or adhesives as well as metallized and PVC films are part of this assortment, stored as half-finished products. After defining your individual slitting combination you can choose the reel length according to your personal demands. You can find our standard stock range after your individual login here. We have certified PE- and PP-products available, designed for the usage on your HP-Indigo machine. Even a clear-on-clear version is in stock. No matter whether you print on a WS 6600 or an older model, our Indigo film range will work trouble-free. And if you need a specific solution, please don’t hesitate to contact us.